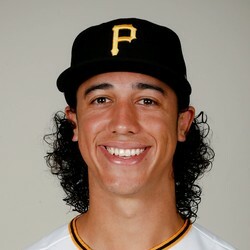 Tucker was promoted after an injury to Erik Gonzalez, and unlike the other shortstops on Pittsburgh's 40-man roster, Tucker could have some fantasy appeal. He swiped 35 bases at Double-A in 2018, and had a .994 OPS at Triple-A before his promotion. In deeper leagues Tucker could be a good source of speed, and if he plays well he could easily usurp Gonzalez's role as the every day shortstop.